Regulations on The Use of Low Altitude Airspace Management (for Trial Implementation) have been established in order to implement the low altitude airspace management regulations, communication and navigation systems and flight service stations. Recently, China’s first low altitude route “Zhuhai – Yangjiang – Luoding” has officially been opened to air traffic. It is a distinguished milestone to give freedom to China’s low altitude airspace reform. According to statistics, there are 178 general aviation enterprises registered in China, 1.610 general aviation aircrafts available, 399 general aviation airports and temporary landing points. It is predicted that, over the next 20 years, the number of civil helicopters in China is going to reach an estimated amount of 10.000 units. Over the the next 10 years, the Chinese general aviation industry demands over 640 billion RMB. 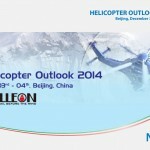 In order to support the development of the helicopter industry in China, the Helicopter Outlook 2014 will take place on December 3rd and 4th 2014.